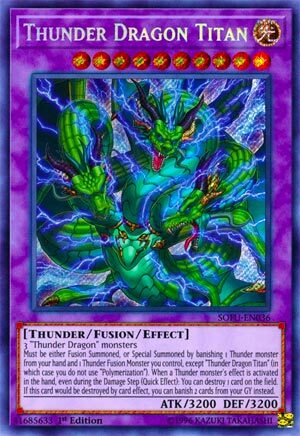 3 “Thunder Dragon” monsters Must be either Fusion Summoned, or Special Summoned by banishing 1 Thunder monster from your hand and 1 Thunder Fusion Monster you control, except “Thunder Dragon Titan” (in which case you do not use “Polymerization”). When a Thunder monster’s effect is activated in the hand, even during the Damage Step (Quick Effect): You can destroy 1 card on the field. If this card would be destroyed by card effect, you can banish 2 cards from your GY instead. The Top 11 cards of 2018 has come, where it will end on December 31st, the last day of 2018. Starting off the list at the Number 11 spot, from Soul Fusion, we have Thunder Dragon Titan. Thunder Dragon Titan is a Level 10 LIGHT Thunder Fusion with 3200 ATK and DEF. Stats are good on a Level 10, LIGHT is great and Thunder is well supported now. The requirements to summon this is either 3 Thunder Dragon monsters or you can instead Special Summon this by banishing a Thunder Fusion from your field and a Thunder Effect Monster from your hand, Instant Fusion and Brilliant Fusion makes the latter easier to do with Gem-Knight Prismaura and Kaminari Attack and Thunder Dragon Fusion will fuse 3 Thunder Dragons with great ease. When a Thunder monster’s effect activates in the hand (Quick Effect, even during Damage Step), you can destroy 1 card on the field. Not a once per turn makes this great for clearing the opponents board, especially since Thunder Dragons have many effects to activate in the hand, some during either player’s turn. The only thing is that if your opponent chains something to a Thunder monster in your hand, you can’t pop with Titan. Still makes this a good disruption card. Finally if this would be destroyed by card effect, you can banish 2 cards from the GY instead. I guess they didn’t put battle because 3200 ATK isn’t easy to get over. Banishing two cards means potentially you can use two Thunder Dragon effects, some of the better ones being Dragondark, Dragonroar, and Dragonmatrix to get you to more cards. Titan is a good Boss Monster in the Thunder Dragon deck, you can probably max out on this one since it is so easy to get out. Art: 4.5/5 Still very intimidated by a three headed dragon of thunder. Welcome to the Top 11 Yu-Gi-Oh Cards of 2018. We wanted to showcase the top 10, as well as one that just missed the cut, and that card would be Thunder Dragon Titan. I thought TDT would be higher on the list just on the sheer power it possesses. 3200/3200 is going to be tough to get over without any help from effects, and when you add in the built-in ability to protect it from card effect destruction by banishing two cards in your grave, I think it should’ve made the cut. ANY two cards, not archetype-specific, and the archetype cards activate upon banishing, netting you pluses on your opponents turn. Ease with summoning needing only a Thunder Fusion Monster on the field and a Thunder monster from your hand. Thunder Dragon + Kaminari Attack off the Instant Fusion gets you this behemoth, or you can use three Thunder Dragon monsters. It’s one of the reasons why Thunder Dragons are so great right now. Mid-to-late game this monster will swing momentum in its players favor. You don’t even need to run Thunder Dragons to be able to summon this, and that’s what puts this into an upper tier as a boss monster. How many archetype Fusion monsters do you know that can be summoned outside the archetype without jumping through hoops? It may have not made the Top 10, but it still is one hell of a boss monster. Happy Monday! Thunder Dragon Titan is a hell of a boss. All the stats are still great seeing as this was reviewed not too long ago and there was not any power shifts. TDT still looks amazing too. 3 Thunder Dragon monsters would be too much for Polymerization. Fortunately, Thunder Dragon Fusion exists, or you can also just banish a Thunder Fusion Monster from the field and a Thunder monster from your hand. Easily getting out a 3200 Atk beater is worth a good score on its own. Thunder Dragon Titan keeps on giving with a non-targeting destruction effect after a Thunder monster effect is activated in the hand. This Quick Effect can trigger after your opponent’s effect and it can be activated during the Damage Step which is very rare and awesome. Finally TDT can banish any 2 cards from the grave to prevent destruction from card effects. Thunder Dragon Titan ticks off every box: Ease of Summon, Offense, Defense, and Versatility. Triple Shenron for the win. Here we are, the end of the year, and it’s time for our annual top cards of the year countdown. Top 11, in this case, but we’ve done 11 instead of 10 before, so fun. Thunder Dragon Titan, which was reviewed pretty recently, and appropriately finding a way onto our list here, kicks things off. So below is mostly my review from before, with tweaks from now, given the review was only a month ago. We see at first this card has an alternate Summon condition where you can remove a Thunder Monster from your Hand from play as well as a Thunder Fusion Monster you control, other than this card. This is a behemoth of a monster, 3200 attack is going to take down most anything (and the defense, if you need, should stand up to almost anything. Titan doesn’t require Polymerization, so that’s a plus, as is having another way to bring this card out. So first, as a Quick effect, when a Thunder effect is activated from the Hand (and a rare case where this works even during the Damage Step) you get to destroy one card on the Field. This is VERY good, better as a Quick effect, and one you should easily and frequently be able to capitalize on.